A report by the Tax Foundation, funded by the NC Chamber Foundation, gets it wrong in its assessment of the impact of tax changes made by state lawmakers in recent years. The plethora of charts and figures created by the Tax Foundation fails to detail the important loss of revenue that has hindered the state’s pursuit of important foundation-building for a strong economy—investments in schools, research and development, entrepreneurship and innovation. The assessment also masks the shift in tax responsibility to the majority of North Carolinians and away from the wealthy and profitable corporations. Proclaiming that the state’s tax climate has leapt from one of the worst to now one of the best largely as a result of tax cuts provides no insight regarding the fiscal and economic health of North Carolina. Just as a good accountant understands that positive business earnings don’t equate to a financially sustainable enterprise, this reality also applies to tax policy and the economy. In fact, the Tax Foundation’s rankings reflect little more than the tax policies they and their corporate funders want to see rather than a robust body of evidence about what economies need to prosper. In fact, the pursuit of low-taxes has not been demonstrated to consistently deliver the economic returns promised. Below are three notable takeaways from the Tax Foundation’s assessment of tax changes passed by state lawmakers since 2013. Tax cuts reduce the amount of revenue that would otherwise be available for public investments. The costly tax cuts passed by state lawmakers were not fully paid for, resulting in less revenue for public schools, affordable higher education, healthcare services for the elderly, and other public services. Under the 2013 tax plan, the General Assembly Fiscal Research Division’s (FRD) original cost estimate of the fully implemented plan totaled more than $700 million in annual revenue loss – revenue that otherwise would have been raised under the old tax code. BTC’s estimate found a nearly $1 billion price tag for the full tax plan. The cost of the tax changes has driven choices in our state budget that include: underfunding teacher pay, failing to increase the number of NC Pre-K slots to ensure that children enter Kindergarten ready to learn, tuition hikes at public college and universities, and the loss of high-value faculty at public universities. Bottom line: The Tax Foundation lauding a more appealing tax climate fails to acknowledge that investments in core public services matter to businesses. Tax changes passed by state lawmakers since 2013 largely benefit the well-off and profitable corporations, making the state’s upside-down tax system worse. The arbitrarily-selected taxpayer scenarios included in the Tax Foundation report do not accurately illustrate the true reality of the tax shift. It does, however, highlight the flaw of using sample taxpayers rather than incidence analysis to analyze the impact of the tax changes on North Carolina taxpayers. BTC could, and has, easily identified hypothetical taxpayers who carry a heavier tax load under tax changes since 2013. Not least of which are the nearly 1 million working North Carolinians who lost the state Earned Income Tax Credit, which was part of the tax changes since 2013. The combination of these facts and the economic incidence analysis show that a tax shift was real for North Carolinians in 2013 and beyond. Here are some notable problems with the Tax Foundation’s sample taxpayer scenarios. Sample Taxpayer #2: Scenario looks to assume that all of this retired couple’s income consists of social security benefits or certain retirement income that is excluded from state income tax. However, tax changes since 2013 no longer allow retirees to exempt a portion of retirement income from public or private retirement plans that is not under the Bailey Act exemption. Accordingly, a $0 state income tax liability will likely not be the reality for many retirees. Sample Taxpayer #5: This high-income married couple with no children would get a tax cut of $3,557 rather than a tax increase of $436, as the Tax Foundation claims. This outcome is due to the Tax Foundation appearing to assume that under the current tax code this couple take the standard deduction rather than itemize deductions. The couple, however, appears to itemize under the old tax code. Under current tax law, this couple could still itemize the $85,313 in deductions needed to arrive at the state income tax estimated by the Tax Foundation – via unlimited charitable contributions and up to $20,000 in combined deductions for mortgage interest and real estate taxes. Sample Taxpayer #6: This ultra-high-income married family would likely get a tax cut that is more than twice as large as what the Tax Foundation claims (a $28,650 tax cut rather than $13,512). The Tax Foundation appears to assume that under the current tax code this taxpayer itemize deductions rather than take the standard deduction. The taxpayer, however, appears to take the standard deduction under the old tax code. If the taxpayer itemizes under both the old and new tax code, the resulting tax cut is much larger than presented in the report. More tax changes included in the budget North Carolinians will live under through June of 2017 will sharply constrain the state’s ability to make public investments crucial to promoting widespread prosperity and a growing economy. 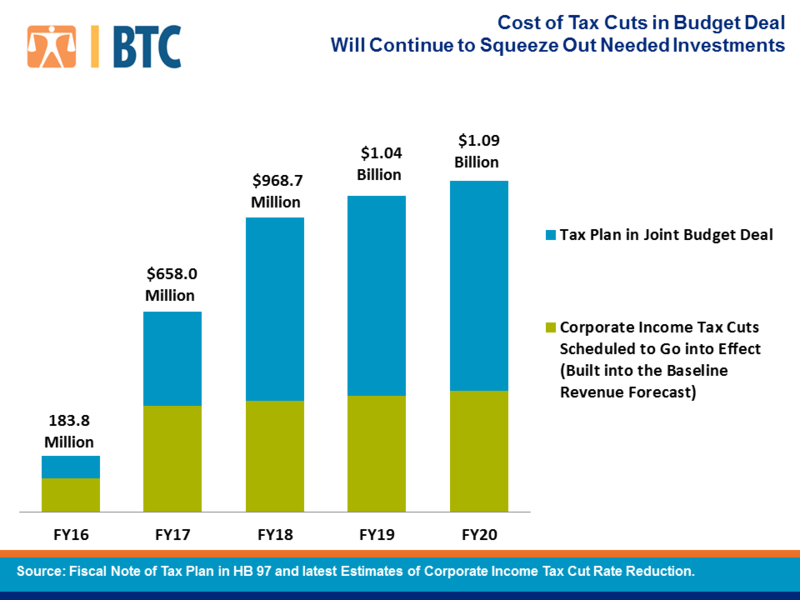 Within four years, the annual cost of the tax changes in the budget balloons to an additional $1 billion each year, according to the General Assembly Fiscal Research Division. The budget also restored the medical expense deduction and historic tax credit, which were eliminated in the 2013 tax plan. This undoing of tax changes signals the ongoing susceptibility of the process to special interests. Case in point, within days of state lawmakers expanding the sales tax base to include more services, this expansion was narrowed to exempt repair, maintenance, and installation services on tangible property and motor vehicles covered under manufacturer or dealer warranties. The ongoing pursuit of the Tax Foundation’s vision for a tax code once again gave the greatest income tax cuts to the well-to-do and profitable corporations. On average, the poorest North Carolinians will pay even more as a share of their income. The recipe for growing North Carolina’s economy requires attention to the North Carolinians who work and spend dollars in local communities and public institutions and services that create the foundation that large corporations, small businesses, start-ups and people looking for a high quality of life demand for their success. Slick graphics and selective stats cannot change the reality: North Carolina is not building an economy that works for everyone with its pursuit of tax cuts above all else.